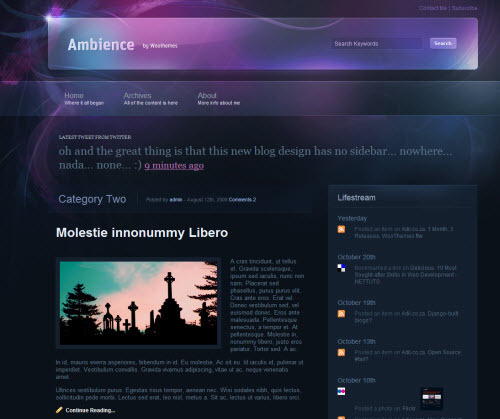 There’s another addition to the Lifestreaming WordPress Themes collection with the relase of the Ambience theme. This is a new theme that just became available at Woo Themes designed by Liam McKay. This looks like a very nice theme, but I would have liked to explore the admin interface to get more details on the Lifestreaming functionality and integration, as it appears to only offer the Lifestream on the sidebar. This is a premium theme at a cost of $70 for a single user license. If you like this, be sure to also take a look at the Agregado theme which is freely available.